Summer is almost over, school is about to start. Seems like this summer went faster than those in the past, but hey... so does everything these days. 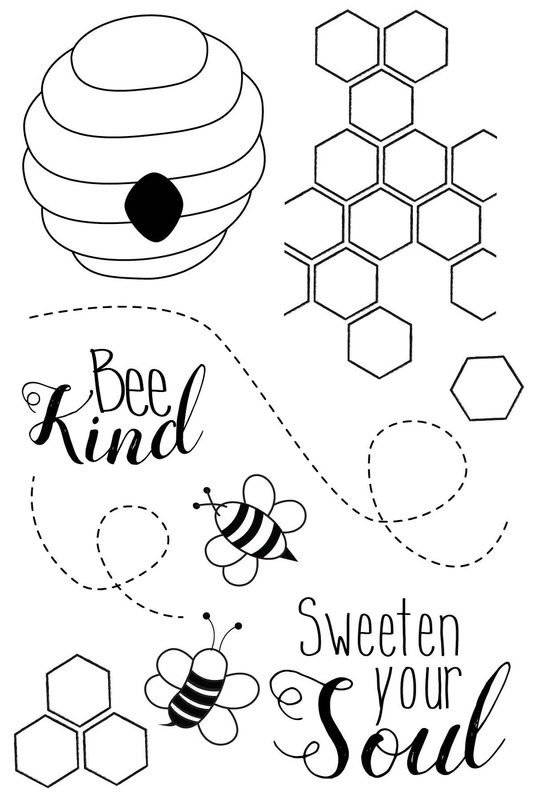 Today I am happy to share with you the BEE KIND stamp set from Joy Clair Stamps. This card idea came to me as soon as I saw the pre-production photo and could not wait to get this set in my hand to put it to work. Take a look at the set and my project and below I will share how it was done. Most of my followers know I am a big fan of my Stampoholic Nano. 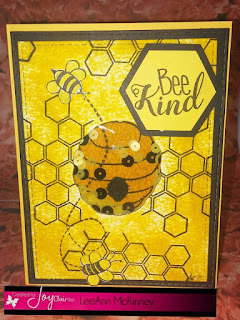 Well what I did with this first was stamped the hive right in the middle of the page and used my Brother Scan n Cut to cut that fun little thing out, I also stamped the bee's and it cut them too... see their awesome little antennae... yeah this machine is great. This was the very first cut made with the machine ten minutes out of the box. SO, after making the cut, I used Fossilized Amber, and Mustard Seed distress inks and ran them all over the card topper. 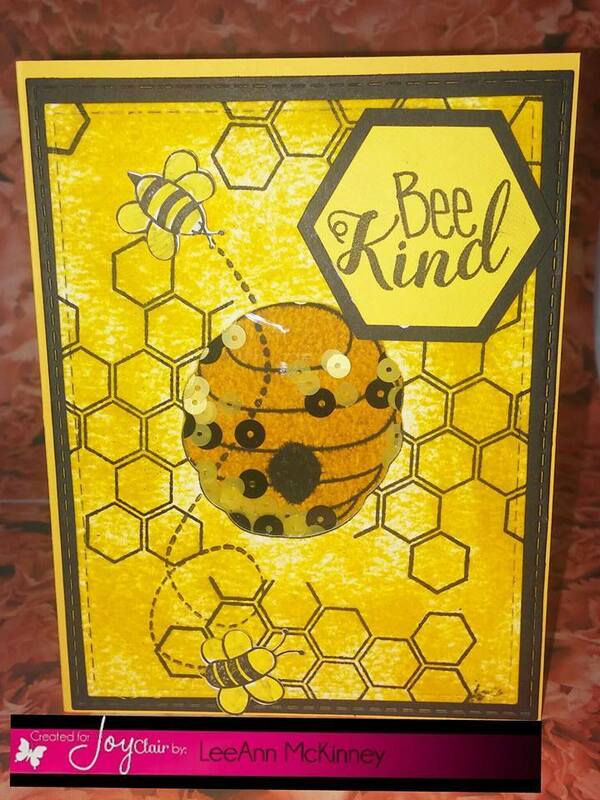 I then after dry stamped the honeycomb and flight path. I then affixed the honeycomb where it needed to be on the card base, ran the topper through my Big Shot to create the stitched look around the edges, and affixed acetate to the back of the card topper, added foam tape around the acetate to add dimension and hold the sequins in. The sequins are a mix called "Bumble Bee", made and sold by my friend Kat her link is in my sidebar. Once my card topper and base were put together I was so happy. It has been a couple of weeks and I could not wait to share this with you today. 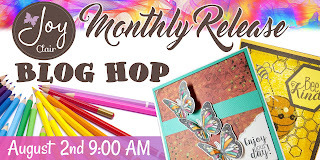 Be sure to visit each of the designers and comment on this blog hop! 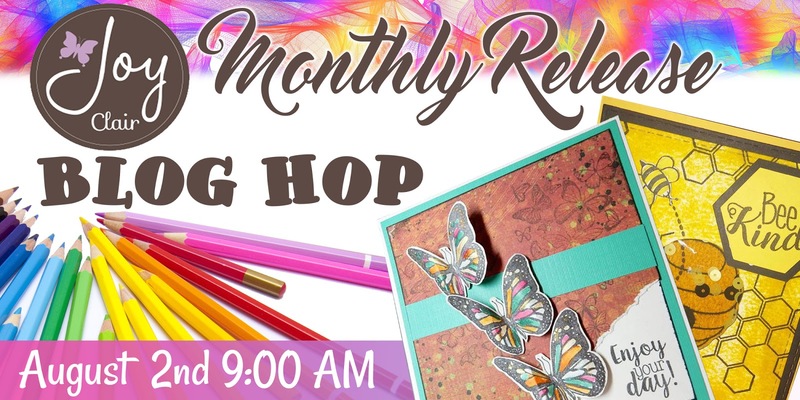 We have an awesome giveaway! Enter for a chance to win 1 of 2 gift cards of $25 dollars each one from the Joy Clair Store! You have until August 4th at midnight (ET) to enter. The winners will be announced here on Joy Clair. Have a great day and enjoy the rest of your hop!!! Love! You're making me like yellow! Adorable shaker card~the sequins add such a fun addition to this darling card! Thank you Sherrie, and I had the same thought. Pretty coloring on your shaker card! Awesome new set! Thank you Denise, yes I love this set. Oh this is so pretty! Love the colors! Cute card! Love the shaker idea! OMG! What an awesome card! Looks like you went for the gold and won with this fab shaker!! I love shaker cards - this is adorable! The cactus set and the bee set are my favourite in this release! Awesome card! Wonderful shaker card!! Pure eye candy!! I really love your design and the pretty yellows! A gorgeous card!